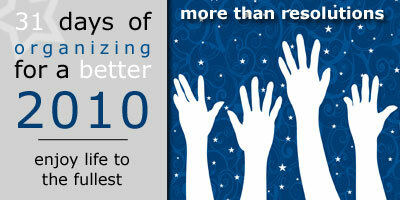 Join us all month for 31 Days of Organizing for a Better 2010! I tend to be a fairly positive person. Oh, those that know me best know that I can get overwhelmed sometimes and slip into negativity, but I try to consciously find the funny or the good in bad situations rather than complaining my way through them. I also believe that life is what you make of it. Sure, there are plenty of people who have the cards stacked against them, but there are also plenty who have overcome more adversity than most of us could even imagine to live a life that the rest of us could only dream of. Please know that if you’re facing a really bad situation — the loss of a spouse or child, the betrayal of your marriage covenant or even extended unemployment — I’m not making light of your pain. Not at all. I’m talking about choosing to be happy even while living on a budget, while working two jobs or when the baby is keeping you up half the night. As we end the 31 Days of Organizing for a Better 2010 series, I want to share my tips for making the most of the life you’ve been given, and Jeff — an obvious choice to collaborate with on today’s resolution — is sharing the three ways he chooses to enjoy life to the fullest at My Super-Charged Life as well. 1. Be content with what you have. Never allow yourself to compain about anything — not even the weather. Never dwell on tomorrow — remember that tomorrow is God’s, not ours. It is so easy to get caught up in “what coulda been” or “what shoulda been” or to wish we had the success/money/talent/beauty of somebody else, but really, what good does that do? None. It just leaves you unhappy and jealous. Choose contentment instead! That said, I don’t think we should sit back and watch life pass us by. Work towards being the person you want to be and having the life you want to have by setting concrete goals and striving to achieve them. Resolutions get a bad rap, but setting measurable, concrete goals for the New Year (or at any time, really) is a much better alternative to accepting the status quo just because that’s the way it’s always been. What are you passionate about? Rather than working a job simply because you don’t know what else to do or volunteering in a certain area just because you always have, figure out what you’re passionate about and pursue those things instead. You might feel stuck in your current situation, but chances are you could change them if you really invested the time and energy. Only you can decide if it’s worth it. Jeff mentions this in his post as well, but it’s important, so I’m going to reiterate his point. If you are reading this post on your computer right now, you have blessings to count. One look at the pictures from Haiti should be enough to convince any of us of that. Take time regularly to thank God for the blessings He’s given you and focus on those rather than the hardships you face. For example, my babies never sleep through the night until they’re one. I’m no good at training them to sleep and I don’t let them cry it out anymore because I’ve decided it’s not the right thing for us (after letting my oldest cry). I was hoping this time would be different, but I’m not surprised that our 4.5 month old is still waking up 2 to 3 times each night. I have three choices when she wakes up in the middle of the night — I can grumble and complain, I can beg and plead with God to please make her sleep or I can consciously pull myself out of the fog of sleep (which gets thicker night after night) to stare at her profile in the dark, feel the weight of her body on my chest and the softness of her hand on my face. Would I love it if she’d sleep through the night? Yes, absolutely. But she’s only going to be this tiny once, and I don’t want to waste a single moment with her wishing things were different. That’s one somewhat trivial example, but in any situation you can choose to either focus on your blessings or your complaints. Honestly, thinking the best of others does not come easily for me. I tend to be cynical and automatically question other people’s motives and intentions. But cynicism can stand in the way of developing deep, meaningful relationships and enjoying everyday interactions with acquaintances. Sure, our cynicism might seem justified, but it’s possible to be prudent and wise while still giving people the benefit of the doubt, and life is more enjoyable when you think the best of the people around you. Are you a positive person? Do you choose contement? The 31 Days of Organizing for a Better 2010 series is sponsored by Get Organized Wizard. Make 2010 the year you get organized and achieve your goals with the Life & Goal Organizer, the ideal system for organizing your goals, plans and life! Do Amazing Things. Don’t Take No For An Answer.